I’ve had a few users with this error this month, so here is a fix. 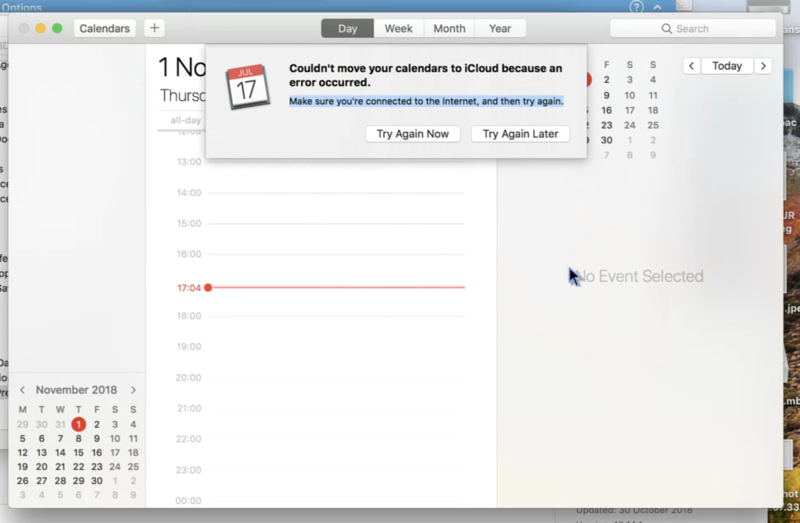 The problem: when you open Calendar on your Mac, you are quickly greeted with a window saying, “Couldn’t move your calendars to iCloud because an error occurred”. It will keep coming back, whatever you choose to do, and it makes the Calendar app useless. I don’t know what the precise cause is – it affects different versions of Mac OS, so it is not system specific. And so the fix is a bit of a blunt instrument, though hopefully without causing any lasting collateral damage. Open System Preferences, go into your iCloud settings and turn-off Calendar sync. Switch to the Finder, select the Go menu with the Option key held down on your keyboard – you will see a menu item called Library appear. Choose Library and find the two folders, Caches and Calendars. Open each folder and select all items (CMD-A on your keyboard) and then delete (CMD-Backspace) everything in the two folders. Then restart your Mac and log back in. Go back to System Preferences, iCloud, and enable Calendar again. Then you can open the Calendar app again. Hopefully the error message has gone. And also your calendar items will return via iCloud after a few moments. Obviously, do the above with care, be sure you have a Time Machine backup, and proceed at your own risk. ← Android: Google Maps is slow – other apps stop working – What to do?